Pistachios can be grown in microclimates with combinations of heat and poor soil and water quality not favorable to many other tree crops. Our early work, including the study summarized here, indicates that pistachios are on of the most salinity-tolerant of tree crops, behind only dates (Figure 1). The objective of this long-term field trial was to determine the relative salinity tolerance limits in a mature production situation of the four commercial pistachio rootstocks: PGI, PGII, UCB-1 and P. atlantica. Based on our previous greenhouse studies, all four rootstocks tolerate with an EC up to 8 dS/m. The range of salinities used in this study was from 0.75 to 12 dS/m. This trees in this study were planted in 1989. The salinity treatments started in 1994, and salinity measurements in the soil-water levels were reflective of the irrigation treatment levels when the trees came in to bearing in 1998. Extensive data was collected from 1997 to 2001. Data included yield, root zone salinity, leaf nutrient analysis, including Na, Cl, and B. Trees on all four rootstocks, irrigated wtih 4 to 8 dS/m water, produced yields equal to those of control trees irrigated with 0.75 dS/m water. All of the trees transpired normal amounts of water. All trees had normal tree water and nutreint status. Only trees irrigated with 12 dS/m water showed some decrease in yield, though not significant. The data suggest that the reason for decreased yield at the higher salinity levels is not specific-ion toxicity in leaf tissue. It appears that the osmotic pressure of the soil solutions (relative to the control of 0.75 dS/m), impair the ability of all the rootstocks to extract water from the soil. The fact that there was no to measurable water stress in spite of decreased water uptake suggests that all rootstocks have the ability to adjust osmotically. However, at higher salinity levels, this osmotic adjustment results in the decreased productivity observed at the 12 dS/m salinity level. 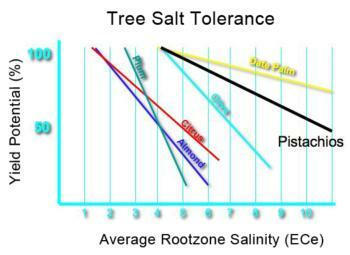 Our results indicate that trees on all four rootstocks are tolerant of irrigation water salinity. However, the irrigation treatments were initiated when the trees were five years old, with well-developed root systems, and evaluated after the ninth year. This work demonstrated that saline water up to 8 dS/m can be used to irrigate a young, well-established nonbearing orchard. The impact of saline irrigation on a young orchard from Day 1 of its establishment, was beyond the scope of this project. Therefore, the practical application of this study should not be extended to trees outside of the experimental parameters.